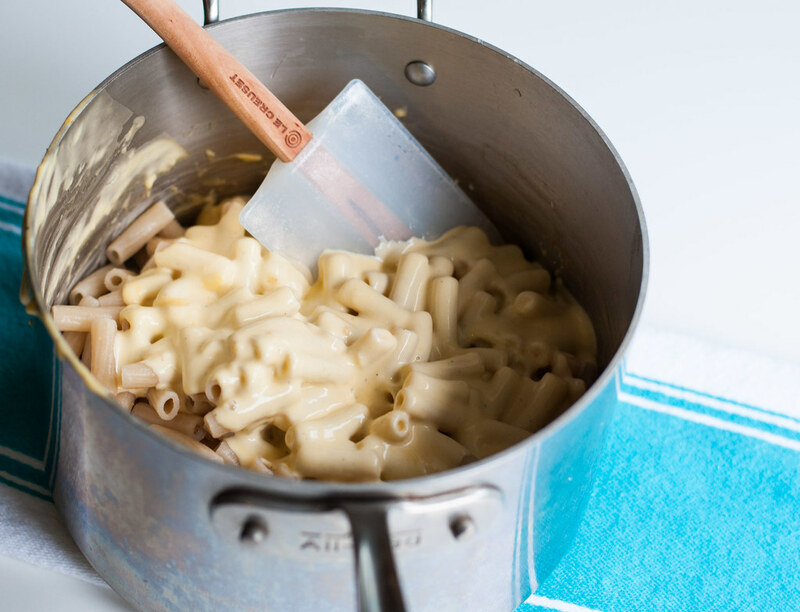 Eliminating a second pan for heating milk while you work on the roux saves mess and time, making this a weeknight treat or the perfect crowd-pleaser for your next get together. The original recipe is topped with extra cheese and baked in the oven, but that’s not even essential. You could stop after combining the noodles and sauce and serve it up, dare I say, Kraft style (I feel bad even making that comparison). That would put you at FOUR INGREDIENTS TOTAL (see below), and approximately 30 minutes tops, including the time it takes to shred the cheese. I’ve just eliminated every excuse you have for not making this tomorrow–you’re welcome. The single caveat, if you can call it that, to the 30 minute promise I just made, is that the cheese must be at room temperature. If at all possible, shred the cheese yourself at home, so it’s not coated in nasty [gluten-containing] powders. 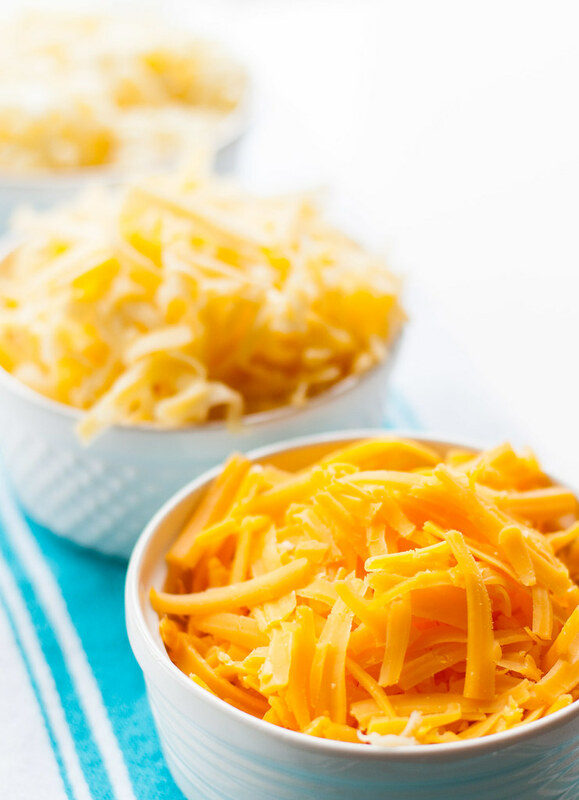 Freshly shredded, room temperature cheese is nice and soft, which is a big reason the sauce works–if the cheese were cold, it would raise the temperature of the hot cream when you tried to combine them, and then you run the risk that not all the cheese will melt. It took me about 8 minutes (seriously) to grate the cheese by hand while it was still cold, so I didn’t end up with a creamy mess on my hands. Do the grating a day or two before, or during any downtime you have during the day, then set a reminder to yourself to take it out of the refrigerator 1 1/2 hours before dinnertime. Also, no complaining about the price of all that cheese or fancy GF brown rice noodles. Simple solution: go to Trader Joe’s (again, not a sponsor of this post). 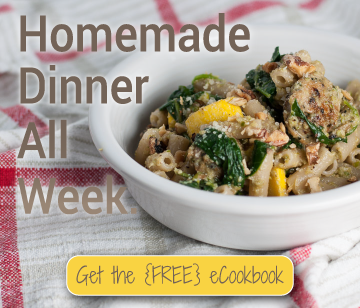 I don’t have the exact cost because my receipt is under a bacon package somewhere in the trash, but I found all three of the exact cheeses from the recipe plus a pound of brown rice noodles plus the cream all for no more than $15.00 total. Now you’re really out of excuses. 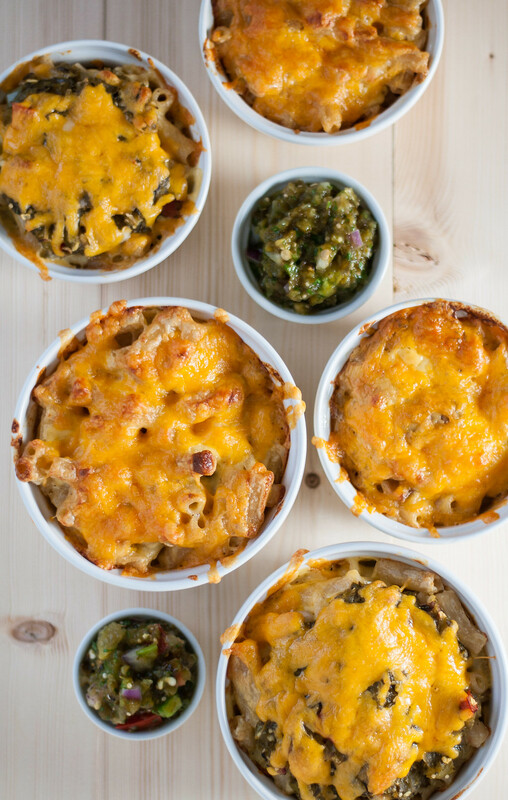 The bacon and green chile salsa are my own evil doings (actually, credit for the salsa addition idea to Steve) and are optional, but the combo of creamy/nutty melted cheese sauce, fresh/spicy salsa, and chewy/salty bacon sends the dish to the ultimate mac and cheese level. Cook the bacon in the oven while you wait for the pasta water to boil, and make the salsa up to a week in advance. It makes a big batch, and after trying it, you’ll definitely want to eat only Mexican food and eggs while it’s in the house. 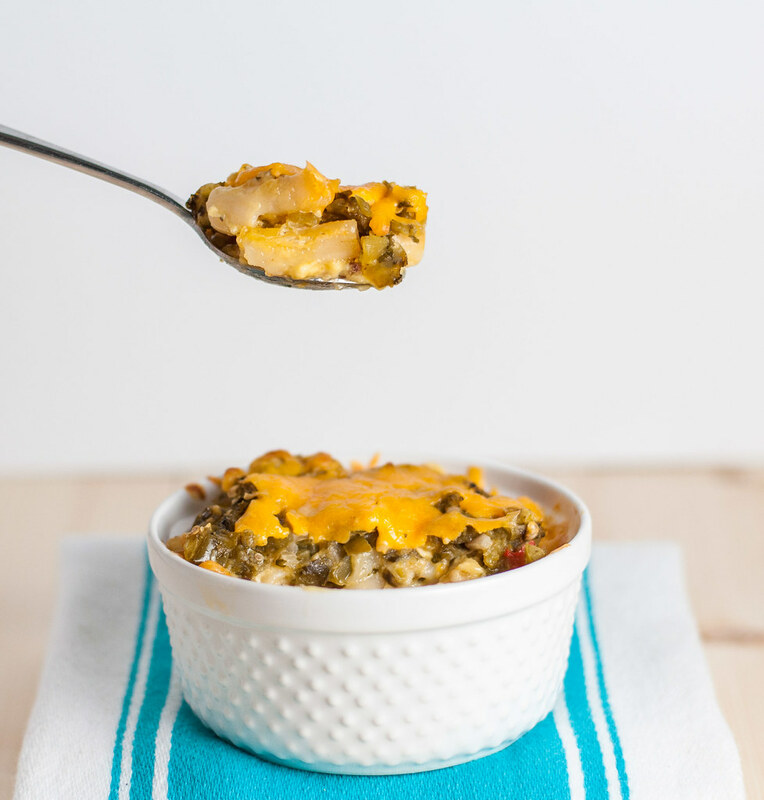 I realize I’ve been a bit bossy today, but I’m just trying to give you as much encouragement as possible to make this mac and cheese in whatever variation you choose as soon as you can. Forgive me. For the FOUR INGREDIENT VERSION, omit italicized ingredients and steps. Remove cheese from the refrigerator to stand at room temperature for one hour. 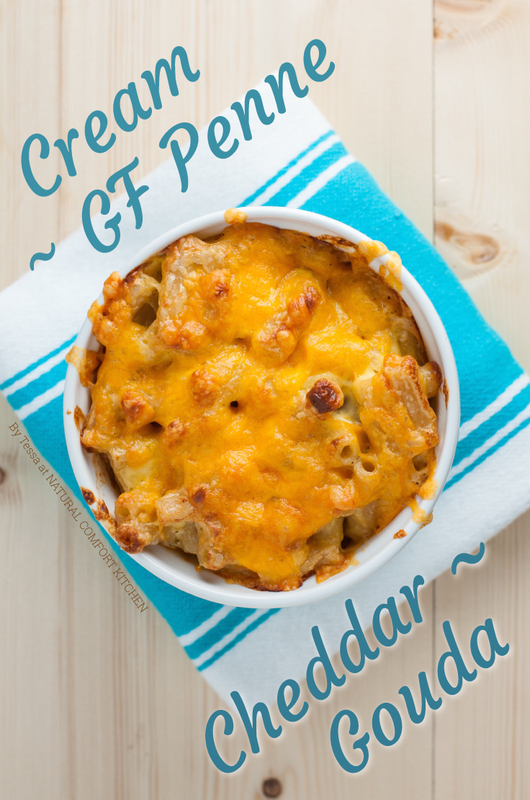 Leave one cup of grated cheddar in the refrigerator. If using bacon, cook in the oven (see link above) or pan fry while the cheese finishes resting. Drain bacon on a couple layers of paper towels. Chop bacon into bite sized pieces, about ½ inch (not bacon bits) and set aside. Preheat oven to 375 degrees. Heat a large pot of salted water to a rolling boil and make the cheese sauce in the meantime. In a medium saucepan, heat cream over medium heat. Continue to raise heat, if needed, so the cream just begins to boil softly. A skin may form on the surface, which is fine—you don’t need to stir it. Turn off heat. Once the water boils, add pasta and cook to al dente. Here’s my exact timing: set timer for 6 minutes 30 seconds, maintaining high heat and returning to a boil. 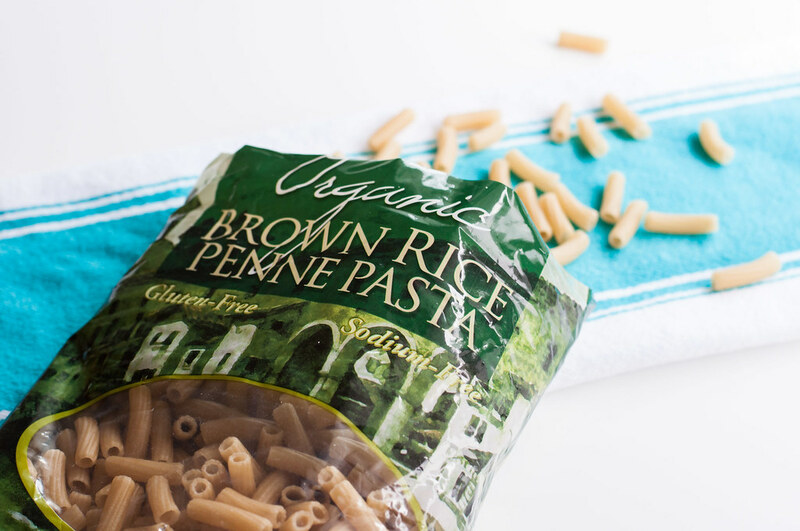 Turn off heat and allow pasta to sit in water for 30 more seconds, then drain, but don’t rinse. Pasta should be quite al dente. It will continue to cook in the oven, and the worst thing you can do to gluten-free noodles is overcook them. Remove ¾ C cheese sauce from the pan you prepared it in. To the remaining sauce, add the pasta and the chopped bacon. Stir well. 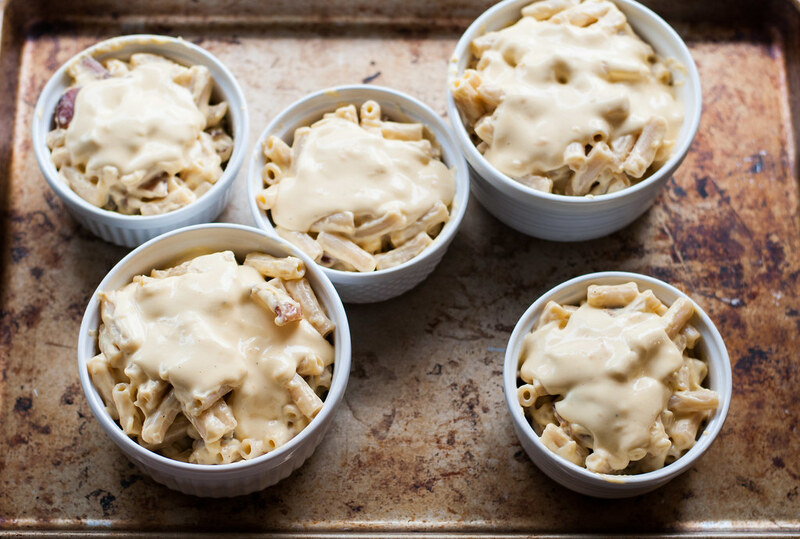 To assemble, distribute mac and cheese amongst four large ramekins or pour into a medium sized (1.5 to 2 qt.) casserole dish. Pour remaining cheese sauce over the top. Spread ¼ C green salsa over each ramekin (or 1 C over the casserole), if using. Top with 1 C grated cheddar. Place ramekins on a baking tray for easier handling. Bake (at 375) for about 20 minutes, or until cheddar is melted and beginning to brown. Cool for 5 minutes. If serving in ramekins, place each on a plate or potholder and be sure to caution your diners about the hot vessels! Gluten free; omit bacon to make it meatless/vegetarian. 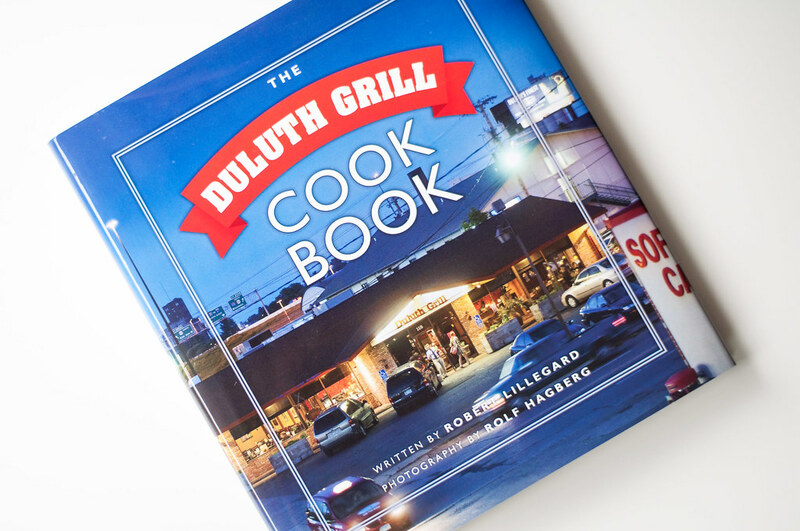 I love the Duluth Grill cookbook feature in this post! I ate there for the first time in July, and can I just say WOW. I ordered their wild rice (no meat!) patty melt with beet hash. So good! 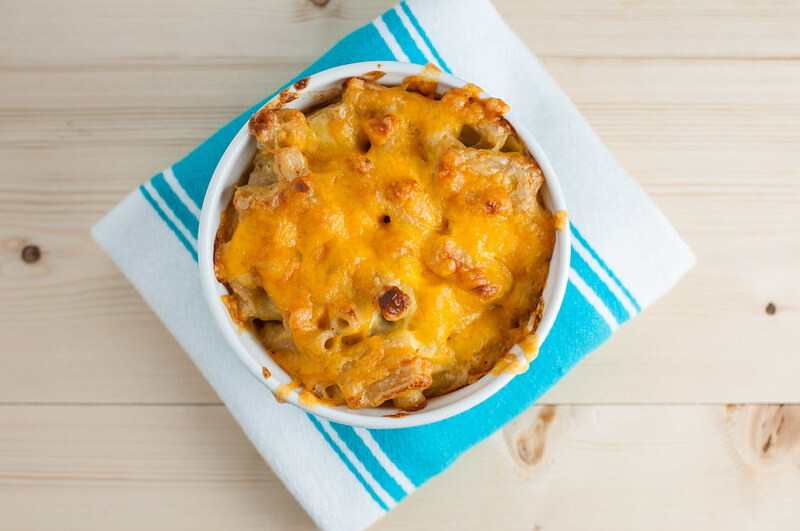 Pinning this mac n’ cheese recipe too! It’s looks divine! Thanks Krista! I am absolutely dying to go back…that patty melt sounds amazing, I have to see if the recipe’s in the cookbook now. People out east just don’t understand the wild rice thing!